At a Stand-Still in Your Cyber Career? Here Is What You Should Do! Do you have five years of experience in computer engineering? What do you think are the prospects now? You may be aspiring to be a Team Lead and later a Project Manager in the same vertical, but do you know how much 5-years experience in cybersecurity is worth? With a little credibility, you can help boost your career and earn a prosperous salary. Cybersecurity is booming and so are the career prospects! The Bureau of Labor Statistics estimated a rise of 18% employment in the field of cybersecurity which is more than the average growth rate. Michael Brown, the CEO of Symantec, predicts that the requirement of cybersecurity professionals would rise to six million by 2019. This will not only open the doors for a vast number of opportunities for new talent but will lead to stupendous growth in the career prospects of experienced professionals from the industry. As an Information Security Analyst, your job role is to protect the organization’s network and build a defensive wall against any hacker’s attack. The analyst is also responsible to perform the disaster recovery plan in case of any threat or possible network outages. A Network Analyst is responsible for the installation, layout, and maintenance of all network components. You are expected to work closely with programmers, IT-managers, and designers in building the entire network framework as per security standards. The job of a Security Engineer is technical and you must have IT skills to get into this role. It is a specialized field of engineer that is associated with security aspects in designing the robust system that should be able to deal with consequences of disruptions of natural and malicious acts. An Ethical Hacker is also referred to as a ‘White Hat Hacker’. Being an Ethical Hacker you attempt to penetrate a network, computer system, or application with permission of the owner on ethical grounds. This attempt is performed to find security vulnerabilities which would have been penetrated by any black hat hacker with the intention of destructing the system. As the Information Security Manager, you are tasked with defending the company’s network and oversee the performance of the Security Analysts. They ensure that all the information security standards are compiled to the mark with no scope for any loopholes. As a Security Architect, your main job role is to oversee the designing of the entire security structure. You are required to play the job role of a hacker and report security vulnerabilities and ensure they have been sorted. A Security Software Developer is again a technical job and an IT expert can easily step into this role. In this job role, you must work on the development of security software and integrate this into the system at all levels. The CISO is an executive-level position whose responsibility is to oversee the company’s security plan and ensure the compliance of all security standards and ensure there are no security breaches. Being in the position of Lead Security Architect you have to analyze, influence and translate business requirements into architectural blueprints in alignment with the overall system. It is a senior position that forms part of the management team. Apart from the job titles that are mentioned above, there are various opportunities that are specialized titles such as Penetration Tester, Incident Response Handler, Forensic Computer Analyst, to name a few. 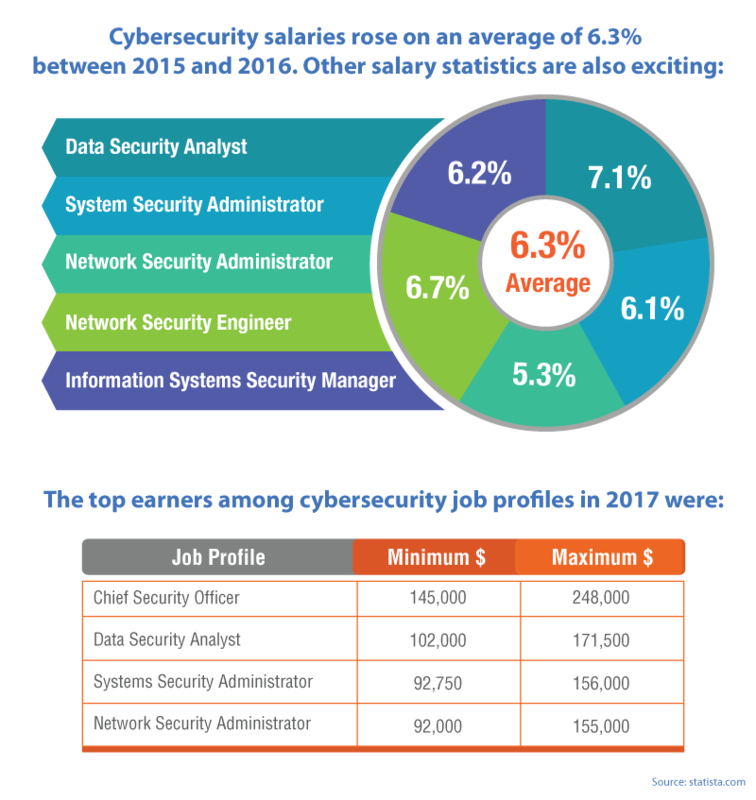 Cybersecurity jobs are some of the highest paid in the world with a constant rise in their payout every year, thanks to the huge gap in the skill requirement. The industry has witnessed three times growth in the cybersecurity jobs when compared to the overall job requirement in the IT sector. When we talk about upcoming opportunities in cybersecurity, we also understand that job titles are looking for experience and a certified degree in the domain. The rise in the profession has also attracted many certification consultants to introduce specialized certified programs. There are few universities offering graduate and master level programs in cybersecurity. What matters is that you attain a recognized certification with hands-on practical exposure. ECCU Master of Science in cybersecurity is meant for those aspiring professionals from a cybersecurity background who want to learn and incorporate the skills required to be system security professionals. The MSCS program is completely online and gives you the opportunity of flexible online study with the ability to consult the faculties for any queries. It offers five different specializations and gives you an option to select the one of your interest to be an expert in.